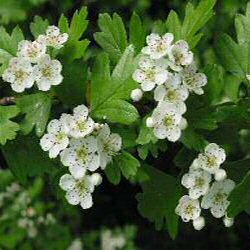 BuyHawthorn Tree (Crataegus monogyna) online from UK tree supplier of cell grown broadleaf hedges and shrubs. More commonly planted as a hedge, it is perhaps forgotten that Hawthorn (Craaegus monogyna) is a native, medium sized British tree commonly found at the woodland edge. A very versatile tree, doing particularly well in most soil types, excepting very wet soils and equally copes with all sites with the exception of dense shade. Hawthorn is fairly fast-growing tree, adding approximately 45cm (1ft 6in) of new growth in a year. During Spring, hawthorn bursts into leaf, followed shortly afterwards by an attractive display of white scented blossom. In Autumn, amazing displays of red-berries appear which are also attractive to birds. Used extensively throughout Britain as a hedging shrub, hawthorn produces heavily-scented white or pinkish flowers in May. Expect a final height of 15m (50ft). Typically, Hawthorn is planted in groups of between 10 and 25 trees. This number of trees is ideal for creating a wildlife habitat and a meaningful source of food and shelter. Spacing may vary between 1m (3ft 4in) and 5m (16ft 8in). Blending of one species into another is suggested although bearing in mind different growth rates. The aim is to mimic what nature intended and thus avoid artificial lines. This tree is a major native, British tree and as a result included in a range of new native woodland.